The Wisconsin Dells is famous for its major water parks. 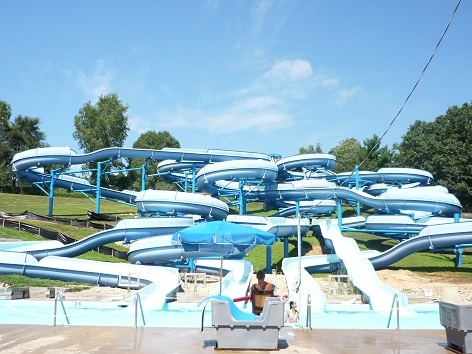 In fact the Dells area is well known as the water park capital of the world. 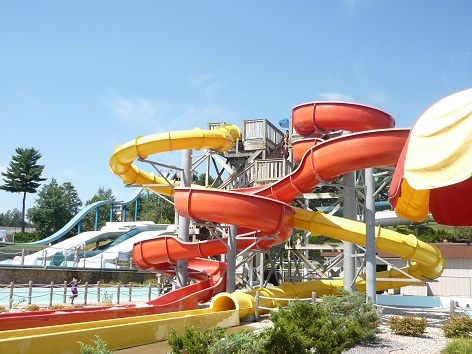 Mt Olympus Wisconsin Dells is known as the largest outdoor water theme park in the Dells with over 100 acres of fun and adventure for the whole family. So welcome mortals to the realm of Zeus, Neptune, Medusa and Poseidon. In the very heart of the Wisconsin Dells is a place where Greek Gods reside and mere mortals tremble in fear! Let us explain….. The very air of Mt Olympus Wisconsin Dells shimmers with power of Zues, and the faint of heart just may run afraid. Do you have the courage and the convictions to stand upon the ground of the God’s and enter into their playground? 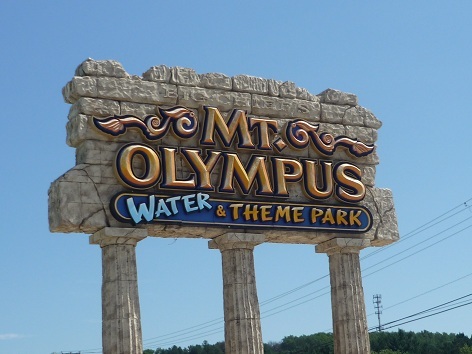 Mt Olympus Wisconsin Dells offers real value and entertainment during the long summer months with not one but two outdoor parks. For those who prefer to stay dry, there is Zeus’ Playground theme park and for those who prefer a really wet and wild time, try the adventures to be had in the undersea water park world of Neptune’s Water Kingdom which offers over 37 waterslides, and 2 wave pools. 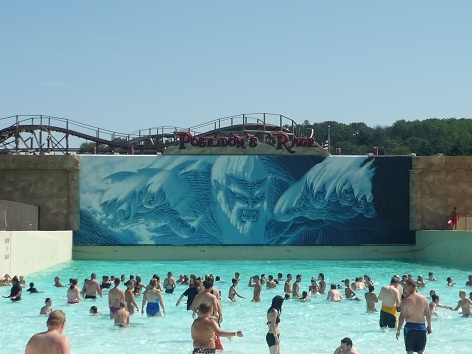 You want to see a for real wave pool … Poseidon’s Rage is not for everybody. So make sure you test the waters before you let your youngsters get too far out. But for those who like to body surf and ride the waves, you can go all day since the big machine keeps them coming often and big. If you arrive at the park early enough, consider placing towels in the Poseidon area as the chairs go very quickly. This is the best wave pool I've ever seen with some seriously amazing waves. 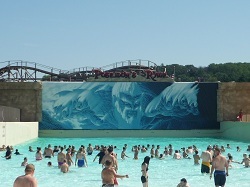 The wave pool is awesome and will give you a great ride. This area can get very crowded and sometimes treacherous with too many people. I would recommend to arrive early, stay late, or arrive in the evening for "Night at the Park". This gigantic pool at Mt Olympus Wisconsin Dells is where you can ride the wild surf or lay on the beach and watch all the action. The waves create an ocean of fun! So, catch a wave all the way in or just bob on the breakers. The shallow water area is well marked for non-swimmers and those who want to lounge in the waves and enjoy a little surf action. This is much more kid friendly as the wave pool releases smaller wave upon wave and you can use tubes to just enjoy. A series of twisting slides, loaded with turns, drops and a few more surprises right down to final impact! Within a flash you come crashing down the slide pouring through a watery, winding journey into the run out. Up to three family members or friends will scream down this 340-foot long raft ride after you hit the 90-degree turn. 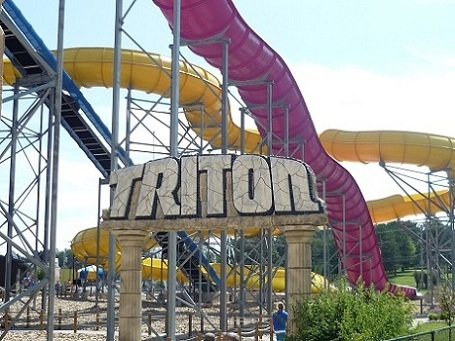 Triton’s Fury and Triton’s Rage are multi-person raft rides and allows an entire family to sit in one big tube and enjoy the ride down. 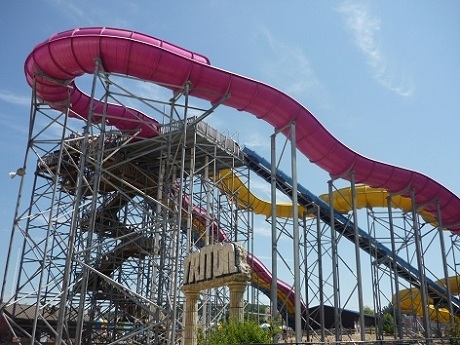 Sure to be a family favorite at Mt Olympus Wisconsin Dells. You climb a 5-story tower and then prepare yourself for the 550-foot drop through a variety of twists and turns. Triton’s Challenge is a bit different in the respect that you go down the speed slide by yourself. However, there are six side by side lanes which allow you to race friends and family. This ride is in a tight tunnel - never knowing what is around the next bend as you slide through this winder in an inner tube for two. An awesome slide for mom or dad with a child. A great slide to test the waters of young and old alike with and a nice splash at the end. Ride high on the curves and race down the straight a ways on this slide. If heights and speed make your day this is one of the best in the world. This slide is nearly a straight down 90 foot vertical drop. You actually are in a free fall and so the rush on this slide is incredible … make sure your swimming suit is tied on tight. Is another tall fast slide that starts some 7 stories up and a second half that just might keep you climbing for more. Once again, tie those suits on tight. The younger crowd will want to spend most of the day in these play areas. This is a huge childrens fort style area with water play activities from top to bottom. One of Mt Olympus Wisconsin Dells exciting children's water play grounds. Complete with gorilla swings, rainmaker geysers, watersides and so much more. Children's water play areas are designed just for the little ones! Mt Olympus Wisconsin Dells has two lazy river area. So take some time to relax and let your troubles just float away. The World's Fastest River! Take a mythological journey on The River Troy. Has over 2000 tubes for floating fun. Shoot your friends with the water blaster on your own electric powered boat. Twice the fun because they're big enough for two. Come all ye heroes to the playground of the king of the Gods and test your courage against the wrath of Hades, tame Pegasus, battle the Cyclops and finally meet Zeus himself. Have ye the courage? The roller coasters seem to be the biggest attraction in this area of the park. Arrive early if want to ride more than once before the lines get too long. Make sure you wear comfortable foot wear. One – there is a lot of walking, two and most important - you are required to wear them on any dry ride at Mt Olympus Wisconsin Dells. They call it Hades for good reason. The towering drop is impossible to go unnoticed no matter where you are at Mt Olympus. Hades was voted Best New Ride by Amusement Today and Golden Ticket Award for Best New Ride by The Travel Channel…and I can see why. The first drop of 140 feet seems like nothing compared to the 65 degree 160 foot drop that sends you underground underneath the parking lot where you are unable to see anything, and then emerging on the other side swooping around and back down underground one final time to quickly make a few more turns. I have to tell you there was a lot of screaming going on, including from myself. 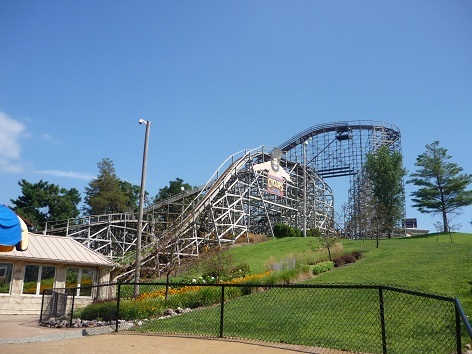 If you like roller coasters and want some excitement, Hades will be your favorite ride at Mt Olympus Wisconsin Dells. Another big fast ride with quick corners. This one climbs 90’, hits 60 mph, on a long track through the forest and drops you back home with a thud. For us, we thought this was the best coaster out of the four. Zues will give you a good ride, but remember to scoot up some on the drops, because you might tend to slam your back up against the back of the seat. Not quite as big as Hades or Zues, but might be a better fit for those that can’t or should not be on the big tracks. This one was not as fast and long as the others so it’s perfect for those who aren’t crazy about roller coasters or for smaller children. It’s no sleeper though, so don’t get too comfortable. Great track for the entire family. Compete for the championship and become the reigning hero with speed, nerve and control. Enter the belly of the Trojan Horse, fly across Helios Track, brave the underwater lair of Poseidon’s underwater realm, and win the heart of Hermes. 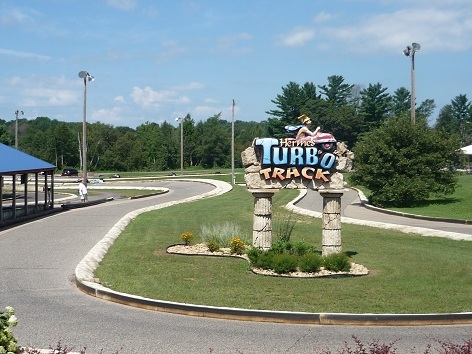 With 9 go kart tracks to choose from at Mt Olympus Wisconsin Dells, we weren’t quite sure which one to choose. We decided to try the Trojan Horse, mainly because it looked the coolest. The Trojan Horse is 3 stories tall and brings you around and around the famous landmark. This could be one of the faster tracks for those who want more of a challenge. This is a six story, multi-towered, underwater go-kart track. You can accelerate through the twists and turns of the raceway and actually plunge under the water. This is longest the longest track in the park. Brave the terrors of one of the Mt Olympus Wisconsin Dells Water parks and show your courage to the world. Are you in your element in the sea? Are you brave enough to face the wild rapids and underwater denizens of the deep? Do you dare brave the God of the sea himself? It's the biggest and longest slide in the park with a jungle Mayan River theme. Fun water slide that drops you into a tropical pool. One of the most exciting slides in the jungle theme with a final splash down. A Tropical Bay with a pirate ship complete with tattered sails, tunnels, and water slides. Cling and climb along the Jungle net as you attempt to cross the river flow. Fun and relaxing easy ride tube ride. Feel the soothing waters and listen to the calming water. Just sit back and relax. Relax and enjoy the warm waters, the relaxing jets of this huge Mayan theme whirlpool. OPA Twister Coaster is the new generation Wild Mouse type ride for the whole family. This 1,378 foot long coaster has dips, drops and ever surprising spins. 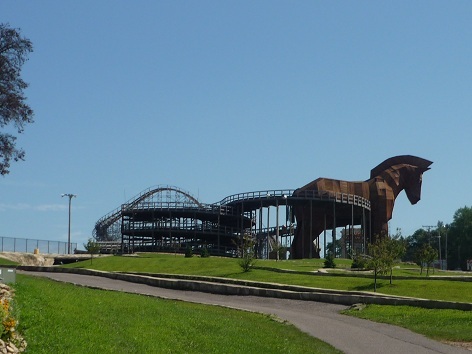 The Only Dells Resort offering Free Unlimited Go-Karts with stay! Round and round the little Tea Cups go spinning out of control. Take an exciting trip out into space as kids dive into a new fun and interactive ball pit! Have a great time with all your friends in this smash up favorite. Hundreds of fun arcade games for the whole family. 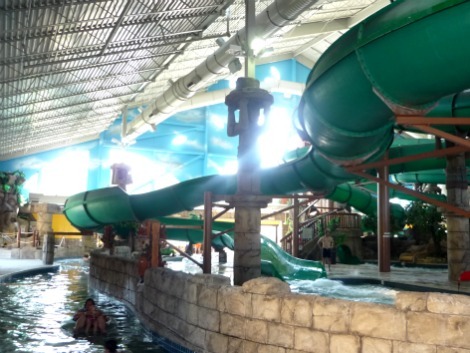 Both the big splash water park and the dryer parks of Mt Olympus Wisconsin Dells has something to offer all ages and temperaments of people making it some of the best theme parks in the world. The tropics indoor water park, Medusa’s is the very first water park ever built in the Dells and is still to this day one of the best. Unlike many other area water parks, Mount Olympus Water Park is open to the public, so everyone can enjoy. There are many different types of rooms available and restaurants of every kind to choose from. They also offer a “name your own price” option for guests. Plus the water park activities are included with your overnight guest fees. Arrive 30 minutes early to get closer up parking and in line for quick entry. Arrive early and ride the popular rides as often as possible to avoid the long lines mid day. Arrive early - you might want to rent a locker. We found the lockers right next to the Parthenon Indoor Theme Park and Neptune’s Outdoor Waterpark. You are not allowed to bring in ANY food or beverage carry-ins. They WILL check your bags, so keep the cooler in your car with soda / water & snacks. You can leave and re-enter the park with your wristband. We put down towels to save a spot in the wave pool area early - the chair space goes quickly. Food is generally expensive - but we expect this at any water park, theme park or sporting event type venue. It's your vacation – so live it up! There are water fountains at several places throughout the park. So if it’s hot today, you might want to keep and refill your plastic bottles after you purchase one. Clothing with inappropriate words, wording, phrases or graphics are prohibited. I would highly recommend wearing aqua shoes or sandals. There is a lot of walking area in this water and theme park. Avoid buying necessities if possible and bring your own sun screen, towels, footwear, sun glasses, hat, etc..
Bring some type of foot wear or sandals as you are required to wear them on any dry ride. Several areas in the park close at different times on different days. Check out the posted signs at the ride entrances. Some areas close at 7 pm, while others stay open until 9 pm. Plan your trip for the weekdays if possible to help avoid the larger crowds and the long lines. Your admission is open to all four water and theme parks. It is also included with any overnight stay at one of the many Mt. Olympus affiliated resorts and hotels. Or, you can simply pay for the day! If you have time to plan ahead, purchase your tickets online, you’ll receive a discount. Children 2 and under are FREE. Mt Olympus Wisconsin Dells is open to the public and overnight guests Memorial Day to Labor Day. Check in is listed as 4 pm. or as rooms becomes available. However, we always arrive early and use the water park until the room is ready. Checkout is 10:30 am, but you can use the water park until later in the day. Check out the website at Mt Olympus Wisconsin Dells for more information.